For those of you residing in the United Kingdom you’ll know your toiletry bag as a “wash bag”, whereas in the United States it’s known as a “dopp kit”. Despite the latter sounding infinitely cooler, both serve the same purpose – a place to store your male grooming essentials – be it in your bathroom at home or when travelling. An often neglected accessory in the modern man’s style arsenal, choose a dopp kit that marries style with function and you’ll own the bathroom. 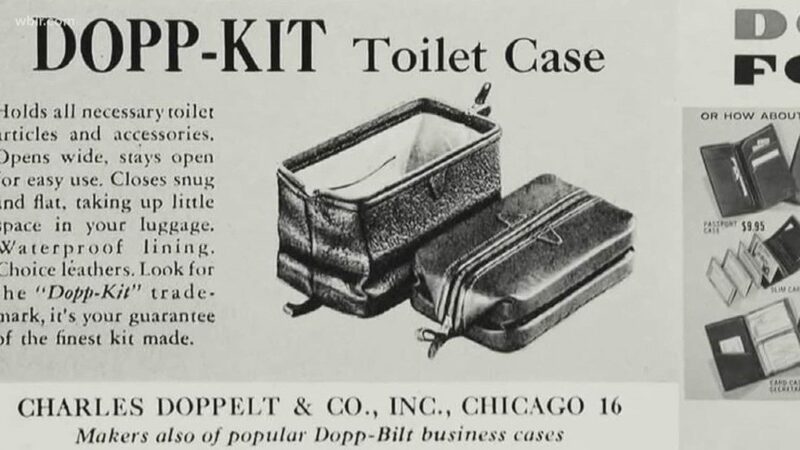 The dopp kit can trace its origins back to 1919, when German immigrant and leather craftsmen Charles Doppelt revealed a travel-friendly toiletry case designed specifically for men. Uptake initially was slow but World War II changed his fortunes, when it became a government issue travel solution for the United States military. Armed forces personnel were administered a dopp kit loaded with travel-sized male grooming products. Subsequently, the Dopp brand name was purchased by Samsonite in the early 1970s and later acquired by Buxton in 1979. Fast forward to present day and the contents of a dopp kit remain similar – but as with anything in the realm of men’s fashion, trends advance and refine. Today’s dopp kits are a style accessory no gentleman should be with out. Often made of hardwearing, waterproof fabrics or high-grade leather, they are both handsome and functional, featuring a labyrinth of specific pouches, slots and zip compartments to cater for all your skin- and haircare needs on the move. Furthermore, you may also find a dopp kit housing a handy mirror or even a “coat hanger”, enabling it to be fixed to the back of a hotel/bathroom door for easy access to your daily grooming arsenal. 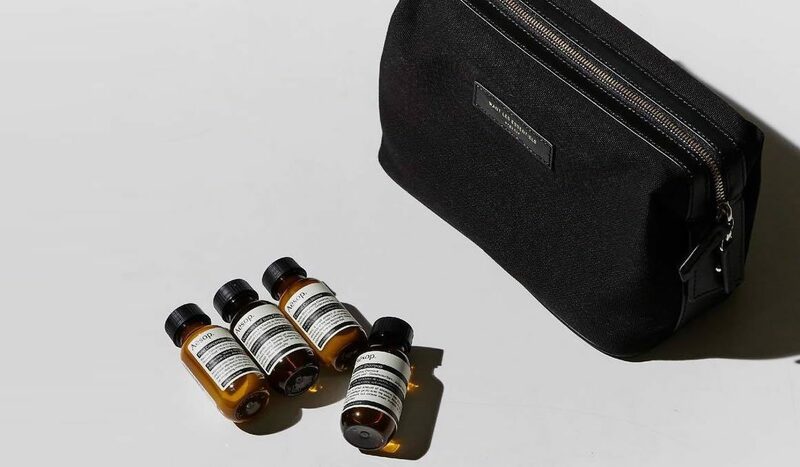 As with anything in the world of luxury, design and function play an important part in the success of a good dopp kit – whilst also contributing to the price tag. Below you’ll find a selection of contemporary designs that tick all the right boxes, at every price point. 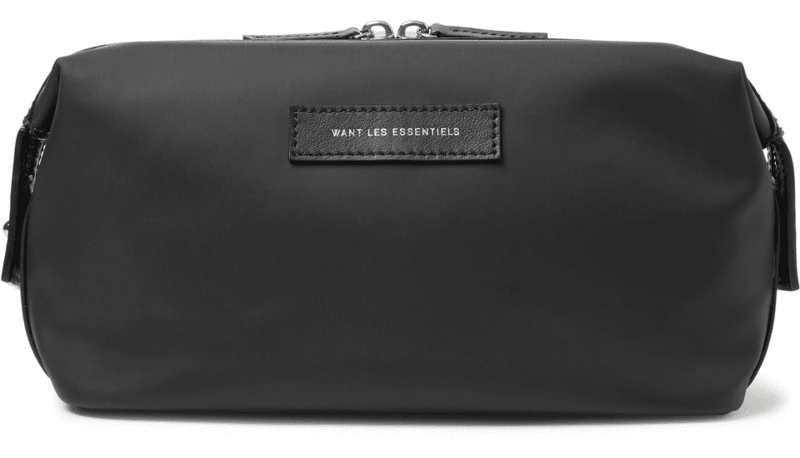 WANT LES ESSENTIELS are luggage specialists and nothing screams “stylish” more than their Kenyatta Leather-Trimmed Nylon Wash Bag. It’s named after Jomo Kenyatta International Airport in Nairobi, and designed for long-haul travel. Crafted from durable nylon, it boasts two internal pockets and a lining that pulls up for cleaning. At 12cm (depth) x 16cm (height) x 26cm (width), it’s a good size – small enough to fit in your luggage but sizeable enough to store your travel fragrance, shaving kit, toothbrush and other essential items. No one does functional better than TUMI when it comes to travel luggage. Their versatile Hanging Travel Kit is proof of point, boasting an internal hanger that is able to be attached to most fixtures. Conversely, it will sit comfortably on a flat surface. Sized at 10.25cm (depth) x 20.5cm (height) x 30cm (width), a U-zip opening to the main compartment and two convenient exterior side-zip pockets makes access a breeze. Furthermore, there are a plethora of handy pockets, as well as small elastic loops, and an anti-bacterial lining. As part of the thoroughly robust TUMI Alpha 2 Collection, this dopp kit is made from the brand’s patented, ultra-durable FXT® ballistic nylon, meaning it is virtually indestructible and will last a lifetime. We’ve all done it: arrived at the airport with an inappropriately opaque dopp kit, and been forced by border control to empty all our prized grooming possessions into a clear plastic bag that won’t seal for love nor money. The solution is Montblanc’s Nightflight Liquid Flight Bag, which offers a way to travel both lightly and stylishly. A smart and practical accessory, it’s clear and securely zipped, facilitating your swift passage through security. At 6.5cm (depth) x 13.5cm (height) x 20cm (width), it won’t take up too much room in your hand luggage, either. Chances are, your favourite grooming brand won’t offer travel-sized products of your full-size favourites. So what do you do when you travel a lot? 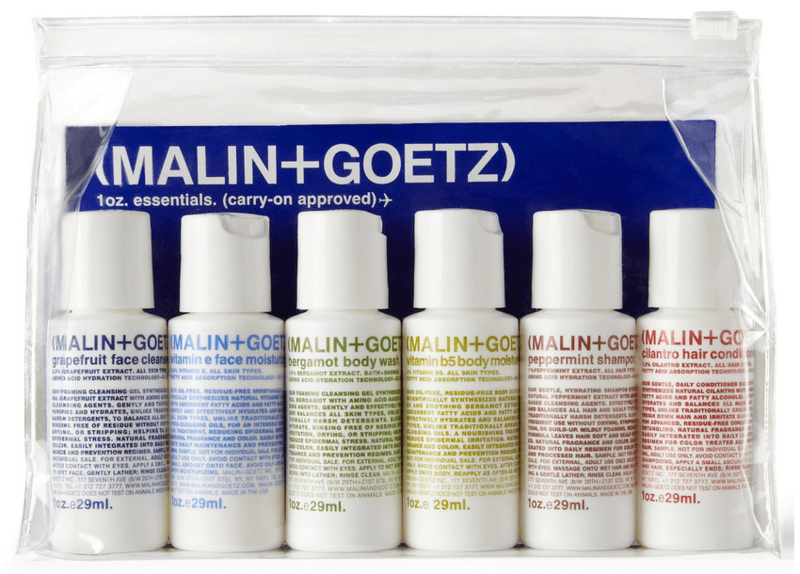 Switch to a quality brand that caters for your international lifestyle, such as New York City-based Malin+Goetz. Famed for their sensitive skin-friendly products, they also happen to be one of the coolest labels around. And best of all, you can experience all their best-selling wares in the form of a travel-ready essentials kit, which includes face, body and hair products all sized for flight. The set features a grapefruit face cleanser, vitamin E face moisturiser, bergamot body wash, vitamin B5 body moisturiser, peppermint shampoo and cilantro conditioner. Each are sized at 29ml, and the kit includes a clear, zip-lock travel bag – a favourite of your local airport security guard. MUJI are renowned for offering great value for money, with their luggage collection proving no exception. 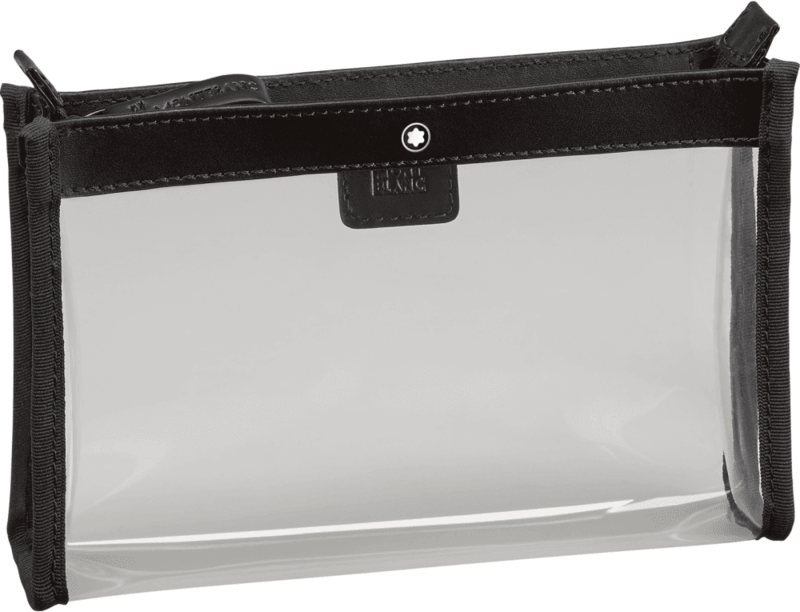 The brand’s Hanging Travel Case is designed with a hook inside, so you can hang it on a bathroom hook or shower curtain rail for ease of access. It’s neat and a good size – 6cm (depth) x 19cm (height) x 16cm (width) – but best of it all, it only costs £16.95, making it thoroughly affordable. Well made, minimal and crafted using practical materials – its robust outer shell and polyester inner-lining is easily cleaned after any spillages – internally you will find the aforementioned hook, a plethora of varying sized pockets, a main compartment with elasticated slots for loose items, and two zip compartments for storing delicate items such as contact lenses and a comb. All in all, it’s another quality offering from the Japanese retailer, helping cement its reputation for high-quality basics. Whilst some of you might be thinking a quality dopp kit isn’t an essential purchase, we’d beg to differ. Not only will it help organise your grooming products while at home, it’ll save you time and hassle whilst travelling, protecting your clothing from any unexpected spillages. No frequent flyer (or style-conscious gent, for that matter) should be without.